Wis. Stat. chapter 128 is an old, but still little-known, alternative to bankruptcy that attorneys should explore as the first option for their clients who have more debt than they can handle, wish to repay, and need the help of a structured plan to get back on their feet. weeping changes to federal bankruptcy law that took full effect on Oct. 17, 2005, have generated much concern both in the legal community and in the public sphere about additional difficulties that the new law presents when a person files for bankruptcy relief. But Wisconsin residents have had an obscure state bankruptcy alternative available to them for decades that provides much faster and easier and, often, more preferable debt relief than does federal bankruptcy. 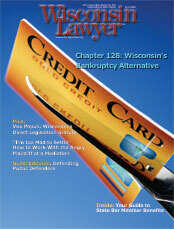 This article introduces the personal debt relief afforded under Wis. Stat. section 128.21, describes characteristics that distinguish this law from federal bankruptcy, and discusses the legal procedure for establishing a section 128.21 action and the roles of the debtor, creditors, attorney, and trustee. The article provides a basic understanding of how this law works for attorneys who would like to integrate this Wisconsin debt-relief option into their practices. Although it is not technically proper to refer to these state-law debtor actions as a "Chapter 128," this bankruptcy-sounding label is widely used for that purpose. Chapter 128 of the Wisconsin Statutes was established in 1937 and was modeled on selected provisions of the federal Bankruptcy Act of 1898, as amended through 1928. The fairly short section of the chapter discussed in this article describes the legal foundation for establishing a personal receivership wherein, much like in a federal Chapter 13 "wage earners" bankruptcy, a person may amortize problem debts through a deliberate and scheduled repayment plan. The statute empowers a circuit court to appoint a trustee to administer the debtor's estate and to issue a protective order that forces most types of creditors to accept remittance via monthly payments over a period as long as three years.1 This arrangement becomes binding even if the creditor and debtor have a contract that dictates different terms. Jeffrey L. Murrell, Marquette 1995, operates a solo practice in Milwaukee, with an emphasis on litigation in criminal defense, family law, consumer, bankruptcy, creditor-debtor law, and state and municipal licensing matters. He is admitted to practice in Wisconsin, New York, and the U.S. District Courts for the Eastern and Western Districts of Wisconsin. In 1969, the Wisconsin Legislature eliminated the original limits on the amount of debt that a wage earner could amortize and on the ability of the wage earner to refile after dismissal and also lengthened the amortization period.9 These changes encouraged wider use of the statute as an alternative to bankruptcy. This history indicates that if interest accrual was preserved during the pendency of a section 128.21 action, not only would the original legislative intent be contravened, but also the intent of subsequent legislatures to liberalize this statute would be nullified. Although the section 128.21 process has always been much less complex, and far less expensive and invasive, than filing for bankruptcy relief, this is especially true since the 2005 changes to the Bankruptcy Code went into effect. Under section 128.21, the debtor does not have to submit schedules of property or personal finances nor is mandatory counseling, filing of tax returns, a means test, or calculation of exemptions involved. All these steps are required when filing bankruptcy. The debtor begins the section 128.21 process by filling out a simple petition to amortize debt and filing the petition and other paperwork, such as the debtor's affidavit of debts, with the circuit court in the county in which the debtor resides.15 A husband and wife may file jointly. Currently, the filing fee is $22 in every county except Milwaukee County, where it is $25.50.16 Usually, neither the debtor nor the attorney must go to court because the filing of all the necessary paperwork can be done by mail. Another characteristic that distinguishes section 128.21 from federal bankruptcy law is that a debtor need not list every debt owed. The Bankruptcy Code requires a debtor to disclose every debt he or she has, regardless of size or type. When filing under section 128.21, a debtor may include and exclude any debts as desired. Still another important difference between the filing of section 128.21 and of bankruptcy is the procedure concerning meetings between the parties involved. The Bankruptcy Code requires that the debtor and the debtor's attorney attend a meeting of creditors presided over by the bankruptcy trustee. These usually are short, informal hearings in which the trustee goes over the debtor's bankruptcy petition with the debtor and gives the debtor's creditors an opportunity to examine the debtor under oath. There is no requirement that a section 128.21 debtor physically attend a meeting of creditors, although the trustee will notify creditors of a time and place when and where they may meet with the trustee regarding the case.18 This meeting, however, is an option of which creditors rarely, if ever, avail themselves because the goals of the meeting may be accomplished simply by telephoning the trustee's office or mailing proofs of claims to the trustee. Nearly any kind of unsecured debt can be handled through section 128.21. Late rent and overdue utility bills, department store charge cards, state of Wisconsin-imposed fines, accounts already in collections, civil judgments, deficiencies, medical, dental, and veterinarian bills, and Wisconsin speeding ticket fines are some examples of financial liabilities that may be included. A debtor also may include secured debts, like those for house or car payments. But the law allows secured creditors to realize their security in the proceedings.19 Despite the sometimes significant amounts owed to these types of secured creditors, the creditors may agree to the amortization of what is owed to them. However, secured debts such as home and car loans often have monthly payments that are too big for debtors to afford to include in a section 128.21 repayment plan. Any adult Wisconsin resident whose principal source of income consists of wages or salary may file for relief under section 128.21.20 When considering if section 128.21 would be appropriate for a client, the lawyer must address several questions: Is the debtor at least 18 years of age? Is he or she a resident of any county in this state? If not, does the debtor plan to move to Wisconsin? Is he or she employed? If not, does the debtor have any steady source of income? An initial reading of the statute seems to dictate that the debtor must have a steady income from regular employment. However, case law developments have allowed these actions to be filed for people whose sole source of income consists of monthly unemployment insurance payments, Social Security disability benefits, or alimony.21 If the prospective debtor is otherwise qualified for relief under this statute and it appears that filing under section 128.21 would be a viable option for the debtor, then the petition may be filed, even if the debtor's source of income is from something other than a conventional line of work. The trustee typically is nominated by the debtor's attorney and appointed by the court. Regardless of who nominates a trustee, the trustee's role is to serve as a neutral, third-party caretaker for the collection and distribution of payments to the listed creditors.22 Most Wisconsin courts maintain a list of qualified professionals, who need not be attorneys, who are eligible to serve as trustees if the court does not approve the nominee presented by the debtor's attorney. The trustee is compensated with receipt of either 7 percent or up to a maximum of 10 percent of the amount of a debtor's total debt load. The trustee is entitled to 7 percent if the debtor makes payments into the plan via wage assignment, and up to 10 percent if payments are sent directly to the trustee's office.23 The latter is an option for "self-pay" debtors, that is, those who receive income primarily from self-employment or monthly benefits. The trustee's fees and any attorney fees not paid up front by the debtor are rolled into the amount of the debtor's recurring monthly payment. The trustee also determines, based on the amount of debts owed, how much will need to be paid into his or her office each month. The trustee may contact any creditors who do not heed the automatic stay or subsequent court order while a section 128.21 action is in effect and refer violations to the debtor's attorney to take appropriate action in court. In a very real sense, the trustee serves the needs of both debtor and creditor and is as available to a creditor and the creditor's attorney as to a debtor and the debtor's attorney. A section 128.21 plan may be modified to add or drop creditors, subject to the court's discretion.30 Courts and trustees usually are accommodating of arrangements to satisfy listed debts made outside of the plan between the debtor and a creditor. Such creditors typically are dismissed from the case immediately. However, the prohibition against collections, garnishments, and the like would no longer apply to the debt owed. Sometimes, settlement negotiations that at first seemed imminent and certain break down, and the court must be asked to reenter the creditor into the plan. Or, debtors may find that creditors not initially included in a plan threaten to bring collection actions. In these instances, debtors routinely seek, and normally are given approval, to add these creditors to the plan. The protections that exist against the initial creditors then are extended against those subsequently added. This arrangement is feasible only if a debtor is still in a position to repay the entire debt, including the amortized sums from the subsequent creditors, within the remaining time of the original plan. The trustee recalculates the required monthly payment, and if this amount is beyond the debtor's ability to pay, the case can be voluntarily dismissed and a new 36-month plan filed immediately. The revision, dismissal, or refiling of a plan is always subject to creditor scrutiny and objection and to the court's approval. Wisconsin lawyers who do any creditor-debtor work at all are ethically obligated under SCR 20:1.1 and 20:2.1 to at least be aware of how section 128.21 operates so that they may be able to advise their clients about it. The decision about whether to file bankruptcy or to seek relief under section 128.21 entirely depends on the unique circumstances of each person's case. But Wisconsin residents in need of quick, effective debt relief should take full advantage of state law by filing under section 128.21, if they have a difficult debt load that they are unable to keep under control but could pay off if the accrual of interest were halted and if the debt repayment were divided evenly over 36 months. The section 128.21 process is easy, inexpensive, and advantageous for both the debtors and their creditors. It should be the first option explored by people living in this state who have more debts than they can handle and who are in need of professional help to get back on their feet. 1Wis. Stat. § 128.21(1), (3)(b). 2See In re Delta Group, 300 B.R. 918, 921 (Bankr. E.D. Wis. 2003), in which the court reiterated the holding of In re Wisconsin Builders Supply Co., 239 F.2d 649 (7th Cir. 1956) (no voluntary provisions of chapter 128, such as section 128.21, are preempted by federal bankruptcy laws or jurisdiction). 3Ralph E. Johnson, Personal Receivership: An Alternative to Bankruptcy, 63 Wis. Law. 15 (September 1990). 6Lloyd K. Garrison, Wisconsin's New "Personal Receivership" Law, 1938 Wis. L. Rev. 201. 7Johnson, supra note 3, at 16. 8Garrison, supra note 6, at 202. 91969 Wis. Laws c. 289; Legislative Reference Bureau Note to 1969 Wis. Laws c. 289, §§ 13, 15. 15Wis. Stat. § 128.21(1), (3). 17See Stellwagen v. Clum, 245 U.S. 605 (1918). 21See Central Nat'l Bank of Wausau v. Dustin, 107 Wis. 2d 614, 321 N.W.2d 321 (Ct. App. 1982) ("wages" can be equated with "earnings," which means compensation paid or payable to an individual, including periodic payments pursuant to a pension, retirement, or disability program). 25Wis. Stat. § 128.21(3)(a), (b), (3g).